The emerging concept is that microRNAs (miRNAs) play a central role in controlling stem cell self-renewal and fate determination by regulating the expression of stem cell regulators. miR-125b, one of neuronal miRNAs, recently was found to be necessary for neural differentiation of neural stem/progenitor cells (NS/PCs). However, the other specific biological role of miR-125b in NS/PCs is little known. We used rat NS/PCs as a model system to study the role of miR-125b in governing the behavior of NS/PCs. We report here the transfection of exogenous miR-125b inhibited proliferation of NS/PCs but promoted differentiation and migration. Whereas anti-miR-125b had the opposite effect. Similar results were observed when Nestin was knocked down by siRNA. Subsequently, we demonstrated that Nestin was a direct functional target of miR-125b. MiR-125b downregulates the expression of luciferase through Nestin 3’untranslated region (3’-UTR), and the regulation was abolished by mutations in the miR-125b binding site. 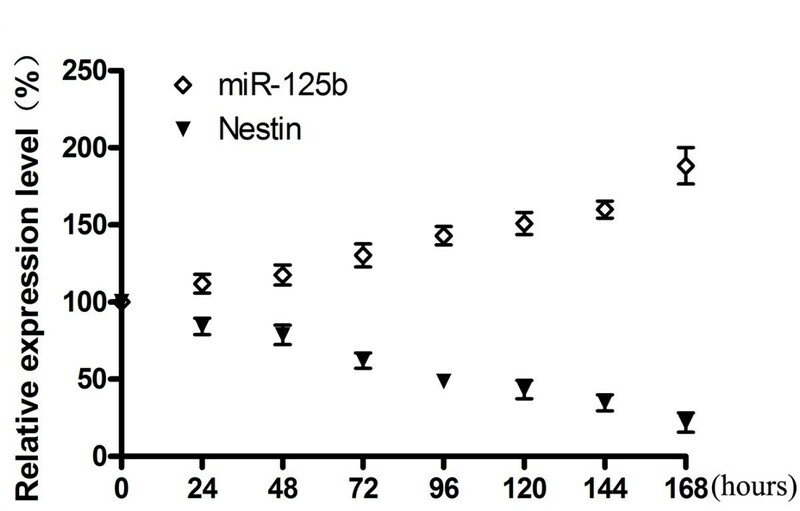 MiR-125b targeted the 3'-UTR of Nestin and reduced the abundance of Nestin at both mRNA and protein levels. The results provided new insight into the function by which miR-125b modulates NS/PCs proliferation, differentiation and migration. The data also indicated the regulatory role of miR-125b in NS/PCs might through the suppression of Nestin expression. Neural stem/progenitor cells (NS/PCs) are the self-renewing, multipotent cells that generate the main phenotypes of the nervous system . Neural stem/progenitor cells (NS/PCs) have been studied extensively with the hope of using them clinically. Recent studies have shown that NS/PCs can act as promising and beneficial adjuncts for therapy of neurological disorders including brain trauma or spinal cord injuries, etc. Although the functional properties of NS/PCs have been studied extensively, the molecular mechanisms underlying neural stem cell self-renewal, differentiation and migration are not fully understood. To better understand the complex biological regulatory mechanisms of NS/PC will facilitate their clinical application in future. The discovery of miRNAs opens new possibilities in terms of modulation of stem cells lineage commitment and differentiation [2–4]. As a recently recognized class of small noncoding RNA molecules, miRNAs are epigenetic modulators of mRNA degradation or protein translation. Functional studies indicate that miRNAs participate in the regulation of a number of cellular processes, including development, proliferation, and differentiation [5, 6]. Modulating miRNA expression offers new pathways for post-transcriptional gene regulation and stem cell commitment. Several miRNAs have been implicated in regulating self-renewal of neural stem cells and neuronal fate specification . Many studies demonstrated that in vitro transient overexpression or inhibition of brain-specific miRNAs in stem cells significantly directed differentiation along neuronal cell lineages . Unlike messenger RNAs (mRNAs), miRNAs do not encode proteins, but rather bind mRNAs, regulating their stability and translation into proteins. A single miRNA can target hundreds of mRNAs resulting in very large effects on the molecular constitution of cells. Thus, it is vital to understand the unique functions and targets of miRNA. MiR-125b, a brain-enriched miRNA, is highly expressed in the central nervous system (CNS), including the brain and spinal cord. As a homolog of lin-4 (82% identical), miR-125b is highly conserved from flies to humans (100% identical) . Upon neural differentiation, miR-125 as a key player in the molecular cascade that contributes to the irreversible commitment of pluripotent human stem cells to the neural lineage . Minh T et al. have also demonstrated that the ectopic expression of miR-125b increases the percentage of differentiated SH-SY5Y cells with neurite outgrowth. Their report demonstrates that miR-125b is important in regulating neuronal differentiation . In addition, it has also been demonstrated that miR-125b was up-regulated during neural differentiation of embryonic stem (ES) cells and embryo carcinoma (EC) cells. MiR-125 was identified as being involved in mechanisms governing the repression of self-renewal in embryonic stem cells . Taken together, these observations suggest that miR-125b may act as an ancient regulatory switch for neuronal differentiation in stem cells. In the present study, we systematically investigated the functions of miR-125b in NS/PCs and found new downstream target of miR-125b. We demonstrated the important role of miR-125b in coordinating the proliferation and differentiation of NS/PCs using both knockdown and ectopic expression approaches. We also identified miR-125b promotes migration during the early stages of neuronal differentiation. Furthermore, our studies first demonstrated that miR-125b suppresses the expression of Nestin by binding to the 3'-UTR of its mRNAs. As a widely employed marker of multipotent neural stem cells, Nestin was involved in a number of cellular processes, such as proliferation, differentiation, migration [13, 14]. Our study presented here revealed a previously undescribed link between miR-125b and an essential stem cell regulator Nestin, identified it as a key target of miR-125b in NS/PCs. NS/PCs may give rise to neural and neuronal progenitor cells, it has been demonstrated that the dynamic changes in the expression of miRNA occurs during neuronal differentiation. In order to understand the role of miR-125b in the regulation of neuronal differentiation, the expression pattern of miR-125b was performed by real-time PCR. The results showed that the expression pattern of miR-125b was up-regulated in a time-dependent manner with neural differentiation proceeded suggesting that miR-125b may be involved in differentiation of NS/PCs (Figure 1). Our results are coincident with previous reports indicating that miR-125b was up-regulated during neural differentiation process [10–12]. Expression pattern of miR-125b and Nestin in NS/PCs during differentiation. Expression pattern of miR-125b in NS/PCs during differentiation quantified by real-time PCR using specific Taqman primers. U6 was used as the internal control. In the meantime, the expression level of Nestin was quantified by real-time PCR during NS/PCs differentiation. GAPDH was used as the internal control. Data represent mean±SD of three different experiments. Toward understanding the role of miR-125b involved in regulating wide array of cellular process in NS/PCs, it is therefore important to identify its target genes. Using the MicroCosm Targets (formerly miRBase Targets), miR-125b was identified to have a conserved target site in the 3’-UTR of Nestin gene (Figure 2A). This program predicted a putative binding site for miR-125b in the Nestin 3’-UTR. MiR-125b is highly conserved in vertebrates, and its mature nucleotide sequence is 100% identical among several species (Figure 2B). Although 3’-UTR sequences of Nestin are not highly conserved in mammals, the putative binding sites for miR-125b in Nestin are also found in both human and rat (Figure 2B). Identification of a miR-125b target site in the 3’UTR of Nestin mRNA. (A) Putative binding sites of miR-125b in the Nestin 3’UTR predicted by Microcosm Targets in different species. The nucleotide pairing of miR-125b and Nestin 3'-UTR. The vertical lines indicate perfect pairing, while ":" indicates G-U wobble. (B) Conservation of miR-125b gene sequences between human and rat. Sequence alignment indicates that miR-125b is 100% conserved in human and rat. To further validated the interaction between miR-125b and the Nestin 3’-UTR, the luciferase reporter system was used. We constructed vectors containing wild-type or mutant 3’-UTR of Nestin directly fused to the downstream of the Firefly luciferase gene to verify that the putative miR-125b binding site in the 3’-UTR of Nestin is responsible for regulation by miR-125b (Figure 3A). The wild-type or mutant vector of Nestin was cotransfected into Hela cells with miR-125b mimics, miR-125b inhibitors, miR-125b NC (negative control), miR-125b INNC (inhibitor negative control). All of them are 2'-O-methyl (2'-O-Me) modified RNA oligonucleotides chemically synthesized by Shanghai GenePharma Co.,Ltd, 2'-O-Me modification is frequently used to protect oligoribonucleotides from degradation in cultured cells. The transfection efficiency was normalized by co-transfection with Renilla reporter vector. When miR-125b mimics were co-transfected with the Nestin reporter constructs, luciferase activity was significantly suppressed compared with cotransfection with miR-125b inhibitors, NC and INNC. However, miR-125b mimics were unable to suppress luciferase expression with the mutant Nestin 3’-UTR which the putative binding sites of miR-125b were mutated (Figure 3B). Considering that there still lies some complementary sequence to miR-125b in the Nestin 3'-UTR besides the bases we have mutated, the binding force between miR-125b and the Nestin 3'-UTR was weakened but not eliminated. Thus the luciferase expression in the mutated vector group was a little suppressed compared to NC and INNC group. Furthermore, we constructed the 3'-UTR vectors of ACTB and then cotransfected the vector into Hela cells with miR-125b mimics and inhibitors. The results indicated that miR-125b mimics and miR-125b inhibitors had little effect on luciferase expression with the ACTB 3’-UTR. 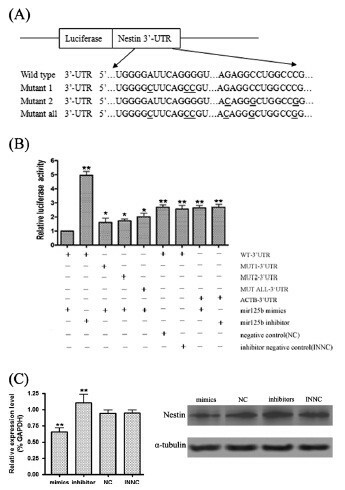 These experiments demonstrated that miR-125b interacts directly with the binding site in Nestin 3’-UTR to regulate luciferase reporter expression. Taken together, these findings indicated that Nestin is a direct downstream target for miR-125b in NS/PCs. MiR-125b suppresses the expression of the luciferase reporter with Nestin 3’-UTR. (A) Schematic representation of the constructs used in the luciferase reporter assay. The Nestin 3’-UTR sequences containing the putative binding sites of miR-125b were inserted into the the pGL3 luciferase reporter vector. Site-directed mutagenesis was performed to mutate base pairs in the predicted seed region targeted by miR-125b in the Nestin 3'-UTR. The mutant binding site is underlined. (B) Luciferase assay was performed 72 hours after transfection using the Dual Luciferase. MiR-125b down-regulated luciferase activities controlled by wild-type Nestin 3’UTR, but did not affect luciferase activity controlled by mutant Nestin 3’UTR. The firefly luciferase activity was standardized to renilla luciferase control. (**P < 0.01 vs. WT; *P < 0.05 vs. WT).The results are means of three independent experiments±SD. (C) The expression level of Nestin was analysed by qRT-PCR and the Western blot in NS/PCs after transfection with miR-125b mimics, inhibitors, NC and INNC. Bars show mean ± SD. All experiments were repeated three times. * P < 0.05 vs. ctr, ** P < 0.01 vs. ctr. Subsequently, we transfected miR-125b mimics, miR-125b inhibitor, NC and INNC in NS/PCs to evaluate whether Nestin mRNA and protein levels are directly affected by the activation of miR-125b. Three days post transfection, the Nestin mRNA and protein level were analyzed by real-time PCR and Western blot (Figure 3C). Transfection with miR-125b mimics led to down-regulation of Nestin mRNA and protein in NS/PC cells compared with NC, whereas treatment with miR-125b inhibitor induced the expression of Nestin increase in NS/PC cells compared with INNC. Taken together, these experiments support the hypothesis that Nestin is a direct target of miR-125b and that miR-125b activation in NS/PCs elicits a decrease of Nestin protein. 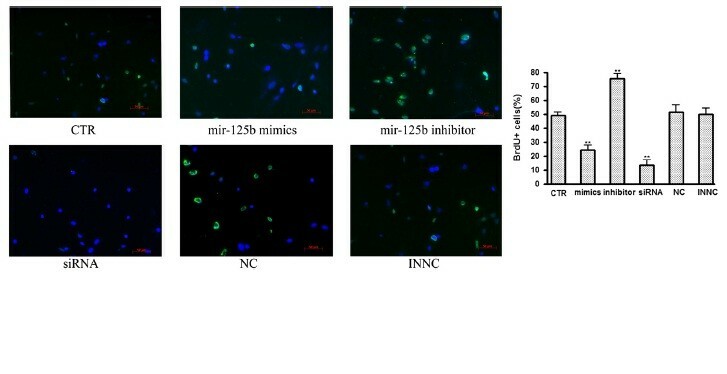 In an attempt to investigate whether miR-125b influences the proliferation of NS/PCs, we performed BrdU labeling on rat NS/PCs after transfection of miR-125b mimics, miR-125b inhibitor, NC and INNC. Considering the tightly packed cells of a neurosphere are difficult to transfect, the neurospheres were mildly trypsinized into single cells and then seeded in polyornithine-laminin coated 24-well plate. When cells reached 70% confluence, the miR-125b mimics, miR-125b inhibitor, NC and INNC was transfected into the cells. The transfection efficiency was observed under the fluorescent microscope. Transfection of NS/PCs with a FAM-labeled miR-125b mimics indicated the high efficiency of transfection after 24 hours (Figure 4A). We also evaluated transfection efficiency by detecting the relative expression of miR-125b. As expected, the intracellular level of miR-125b was elevated by transfection of miR-125b mimics, and was decreased by the transfection of miR-125b inhibitors, showing that the cellular level of miR-125b could be controlled by the transfection of miR-125b mimics and miR-125b inhibitors (Figure 4B). Therefore we used BrdU labeling to investigate the role of miR-125b in cell proliferation, BrdU was added 16 hours prior to stem cell harvesting and then stained with an anti-BrdU antibody. Immunostainings for BrdU show that the up-regulation of miR-125b inhibited the proliferation of NS/PCs (Figure 5). Efficient transfection of miR-125b in NS/PCs. (A) At 24 post-transfection, transfection efficiency was assayed via fluorescent detection of the 5’-FAM labelled miR-125b mimics in living NS/PCs. The high transfection efficiency was demonstrated using fluorescent microscopy. (B) Real-time PCR was used to assess the efficiency of miR-125b transfection at 72 h after differential transfecton. U6 was included as a loading control. 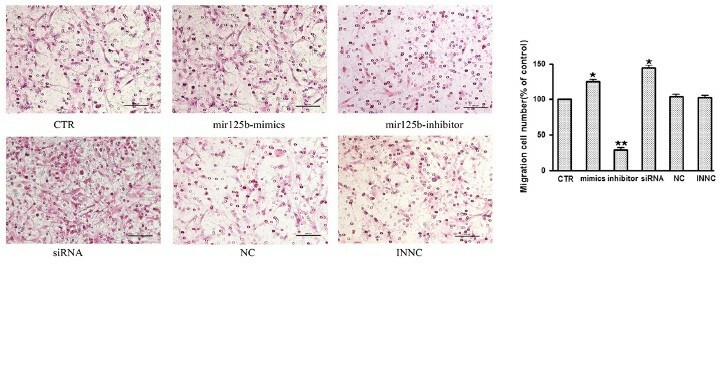 miR-125b inhibit NS/PCs proliferation. Cell proliferation was evaluated by bromodeoxy uridine (BrdU) incorporation. Representative images of NS/PCs stained with Brdu (green) and Hoechst dye (blue) 72 h after transfection. After transfection, the NS/PCs were maintained in growth medium until they were fixed and stained. Images were acquired by a microscope using a 20 × objective lens. The percentage of BrdU-positive cells at 72 h after transfection is shown. Bars show mean ± SD. All experiments were repeated three times. * P < 0.05 vs. ctr, ** P < 0.01 vs. ctr. We next examined whether miR-125b influences the differentiation of NS/PCs. The role of miR-125b in promoting the differentiation of NS/PCs was demonstrated further by staining for neuronal markers. Following transfected with miR-125b mimics, miR-125b inhibitors, NC, INNC, NS/PCs were cultured in differentiation conditions for 72 h. A significant decrease in the number of Nestin-positive cells, Sox2-positive cells and Vimentin-positive cells was found in NS/PCs transfected with miR-125b mimics compared to control group (Figure 6A, B, C). On the other hand, The percentage of Tuj1-positive cells and Map2-positive cells in NS/PCs transfected with miR-125b mimics were significantly higher than control group (Figure 6D, E). The results indicated that miR-125b over-expression enhances rate of neuron differentiation, by contrast, knockdown of miR-125b decreases rate of neuron differentiation compared to the control. 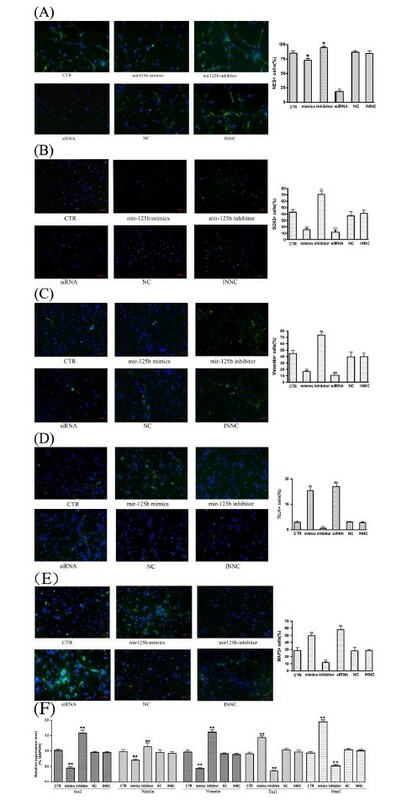 The results of real-time PCR assays were well consistent with the results of immunofluorescence indicating that overexpression of miR-125b can independently increase the expression of neuronal marker Tuj1 and Map-2 but decrease the expression of Nestin, Sox2 and Vimentin (Figure 6F). miR-125b accelerates neural differentiation. After transfection, the NS/PCs were maintained in differentiation medium. The expression of the NS/PCs progenitor marker Nestin (A), Sox2 (B), Vinemetin (C) and the neuronal marker Tuj1 (D), Map2 (E) were detected by immunofluorescence. Images were acquired by a microscope using a 20 × objective lens. Bars show mean ± SD. All experiments were repeated three times. * P < 0.05 vs. ctr, ** P < 0.01 vs. ctr. (F) Real-time PCR analysis of Nestin, Sox2, Vinemetin, Tuj1 and Nestin expression in the same differentiation time course 72 h after transfection. GAPDH was included as a loading control. Bars show mean ± SD. All experiments were repeated three times. * P < 0.05 vs. ctr. We used transwell migration assay to compare the in vitro migratory capacities of NS/PCs among groups transfected with miR-125b mimics, miR-125b inhibitor, NC, INNC. Migration assays were performed after 72h transfection. The percentage of migrated cells was normalized to that of control cells. The results indicated that overexpression of miR-125b led to a increase in cell migration whereas knockdown of miR-125b led to a reduction in cell migration compared to control group in NS/PCs (Figure 7). MiR-125b enhanced the mobility ability of NS/PCs cells using transwell migration assay. Migration assays were performed after 72h transfection. Quantitation and representative photomicrographs showing that miR-125b promote cell migration in NS/PCs. Bars show mean±SD. All experiments were repeated three times. * P < 0.05 vs. ctr. Consistent with previous reports,we detected the relative expression of Nestin mRNA decreased during neuronal differentiation of NS/PCs in our studies (Figure 1). We considered the possibility of these biological changes induced by miR-125b may be due to the down-regulation of Nestin. For this purpose, we knocked down Nestin by RNAi and assayed the effect of Nestin knockdown on cell proliferation, differentiation and migration in NS/PCs (Figures 5,6,7). The results indicated that knockdown of Nestin reduced cell proliferation and promoted neural differentiation and migration in NS/PCs. The siRNA transfected NS/PCs showed a similar biological behavior as observed in the cells transfected with miR-125b mimics. Taken together, our data suggested that miR-125b regulates neural stem cell proliferation, differentiation and migration through targeting Nestin expression. In order to further validate the function of miR-125b in NS/PCs activities via direct regulating Nestin, we transfected NS/PCs with miR-125b mimics and the Nestin overexpressed plasmid (Nes-640-GFP) simultaneously. The plasmid Nes-640-GFP was demonstrated to have a longer half-life and more prominent protein levels in cells, which was kindly provided by John E. Erikssona (Turku Center for Biotechnology, University of Turku and Åbo Akademi University, Turku, Finland) (Sahlgren et al., 2006). We demonstrated that exogenously expressed Nestin could rescue the effect on NS/PCs proliferation, differentiation and migration resulting by miR-125b mimics (Figure 8). Furthermore, we determined to test whether depletion of Nestin may weakened the role of miR-125b inhibitors in NS/PCs. When Nestin was knocked down by siRNA, the stimulus effect on cell proliferation and the inhibitory effect on differentiation and migration which miR-125b inhibitors bring about was weakened (Figure 8). Hence, our data support the idea that Nestin as a downstream target of miR-125b was implicated in NS/PCs activities, such as proliferation, differentiation and migration. MiR-125b regulates NS/PCs activities by targeting Nestin. 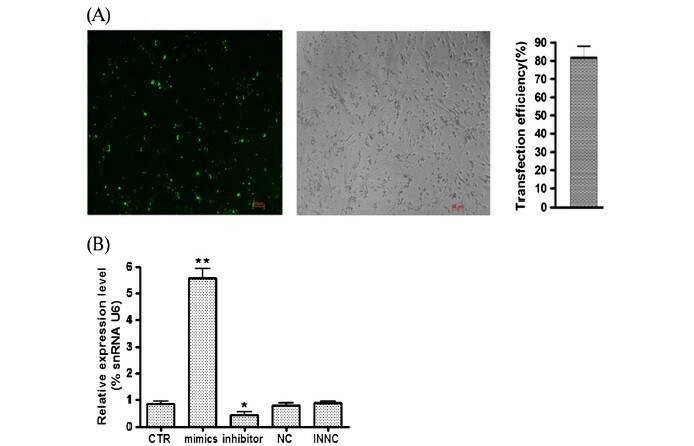 (A) The Brdu incorpation assay indicated that overexpress Nestin may rescue the inhibitory effect on proliferation which miR-125b mimics bring about. Also, the Nestin siRNA may decrease the stimulus effect on proliferation which miR-125b inhibitors bring about. (B-F) The immunofulorescence results indicated that overexpress Nestin may rescue the stimulus effect on NS/PCs differentiation which miR-125b mimics bring about. Also, the Nestin siRNA may weaken the inhibitory effect on NS/PCs differentiation which MiR-125b inhibitors bring about. (B) Nestin, (C) Sox2, (D) Vimentin, (E) Map2, (F) Tuj1. (G) The migration assay indicated that overexpress Nestin may rescue the stimulus effect on NS/PCs migration which miR-125b mimics bring about. Also, the Nestin siRNA may weaken the inhibitory effect on NS/PCs migration which miR-125b inhibitors bring about. Bars show mean ± SD. All experiments were repeated three times. * P < 0.05 vs. ctr, ** P < 0.01 vs. ctr. It is well known that NS/PCs contribute to the neurogenesis of the central nervous system. During central nervous system development in vertebrates, neural stem cell fate are strictly controlled under regional and temporal manners . Besides the discovery of NS/PCs in the embryo, recent studies have substantially demonstrated that NS/PCs continue to reside in the adult nervous system such as hippocampus, the subventricular zone (SVZ), and in some non-neurogenic regions, including spinal cord [1, 16]. NS/PCs persist throughout adult life in nervous system in order to replace the mature cells that are lost to turnover, injury, or disease. In response to CNS injuries, NS/PCs can migrate to areas of injury and differentiate into neuronal and glial cell types, thus are likely to contribute to the repair of damaged tissue. Therefore, unraveling the mechanisms of cellular processes in NS/PCs will provide insights into both basic neurosciences and clinical applications of stem cell-based cell replacement therapies. Although it is well established that NS/PCs have the potential to cure many diseases, the molecular basis of this process, particularly the role of miRNAs, remains largely unknown. MiRNAs are a class of small RNA regulators that are involved in numerous cellular processes, including development, proliferation, differentiation, and plasticity. Emerging evidence has shown that the process of neural stem cell self-renewal, fate specification and migration can be regulated by miRNA . As mentioned above, there is growing evidence to suggest a role for miR-125b during neuronal differentiation. In our study we first quantified the relative expression levels of miR-125b during neural differentiation. It is likely that the distinct temporal expression patterns of miR-125b reflect its specific roles in coordinating gene expression profiles that characterize neural cell fate determination. Real-time PCR analyses indicated that miR-125b is significantly up-regulated during the differentiation of NS/PCs. Our study presented here revealed that the inhibition of Nestin expression by miR-125b provides double insurance to inhibit NS/PCs proliferation when miR-125b expression is elevated upon differentiation. Moreover, our results suggested that miR-125b promote migration during the early differentiation of NS/PCs. The functions of animal miRNAs may be elucidated through their targeted genes. To gain a better understanding the role of miR-125b involved in regulating wide array of cellular processes in NS/PCs, it is necessary to identify its target genes. A single miRNA can recognize hundreds of targets. However, one or two of these target genes may be more important targets in specific cellular context . Data from computational analyses suggest that Nestin may be regulated by miR-125b. As a widely employed marker of multipotent NS/PCs, Nestin is important for the proper survival and self-renewal of NS/PCs. Numerous in vivo and in vitro studies now rely on Nestin expression to track the proliferation, migration and differentiation of NS/PCs . Computer analysis predicted that miR-125b had partial sequence complementarity within the 3’-UTR region of the Nestin mRNA. Using a luciferase assay, we showed that miR-125b directly target Nestin through binding a specific site in its 3’-UTR in NS/PCs. Since miRNAs have been shown to regulate gene expression through both translational attenuation and mRNA degradation. Both real-time PCR and western blot data suggests that miR-125b could repress Nestin expression at both the mRNA and protein levels via directly binding to its 3'-UTR. In line with previous report, we detected the expression of Nestin is high in NS/PCs but it is reduced dramatically upon differentiation. In contrast, the level of miR-125b is increased significantly upon differentiation. In this case, Nestin is preferentially expressed at high levels when the targeting miRNA expression is low. The expression of this target is down-regulated as miR-125b accumulates. Taken together, we identified Nestin as a target of miR-125b in NS/PCs by using a bioinformatics approach and experimental validation. It has previously been reported that miR-125b is a positive regulator of differentiation of human neural progenitor ReNcell VM (RVM) cells , but the underlying mechanism of how it regulates proliferation is not known. Accumulating evidence has indicated that Nestin may actively functions in cell growth or proliferation of different types of neural stem cells. The specific interfering role of Nestin siRNAs was in vitro identified on cell growth of C6 astrocytoma cells, suggesting that siRNA-induced suppression of central neural system tumor cell growth . To support the hypothesis that the effect of miR-125b on cellular process is mediated largely through Nestin, we also knocked down Nestin expression in NS/PCs using its sequence-spcific siRNA. By using BrdU incorporation assays, we demonstrated that overexpression of miR-125b led to dramatically reduced NS/PCs proliferation in line with the results of Nestin siRNA-treated cells, indicating that miR-125b inhibit NS/PCs proliferation by targeting Nestin. Using immunostaining for the neural marker, we evaluated the effect of miR-125b on neural differentiation potential of NS/PCs. Overexpression of miR-125b resulted in the percentage of Tuj1 and Map-2 positive cells increased, whereas that of Nestin-positive cells decreased. There was no difference in the percentage of GFAP positive cells among all groups (data not shown). This could be explained by the fact that most NS/PCs were also expressed glial marker GFAP. In the meantime, decrease of Nestin by RNAi strikingly accelerated the neural differentiation process, suggesting that miR-125b promoted differentiation might be mediated by Nestin. Also, we provided direct evidence that miR-125b is a positive regulator of migration during early neuronal differentiation of NS/PCs. 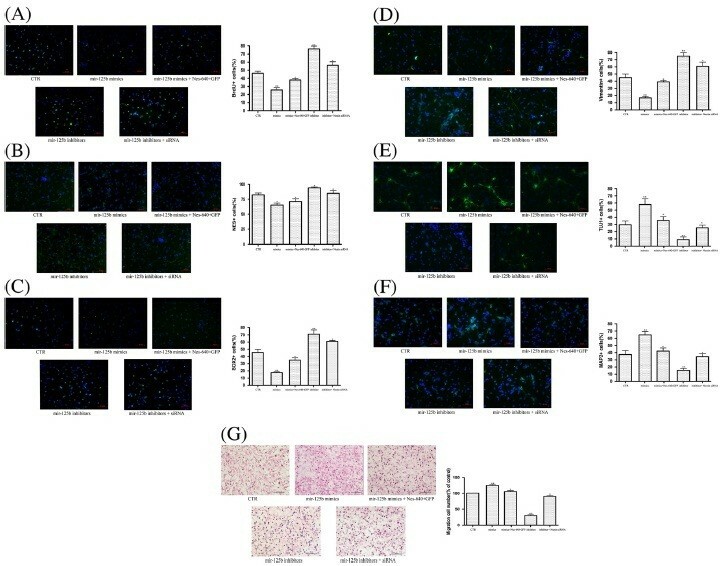 The results are in good agreement with previous findings demonstrating that exogenous miR-125b expression increased migration of ishikawa cells and abrogating expression of miR-125b suppressed migration of AN3CA cells in vitro . Previous results implied that Nestin might serve as a scaffold regulating the activity of the Cdk5/p35 signaling complex [21, 22]. Cdk5 is involved in the processes of neuronal differentiation and migration [23, 24]. Given that knockdown of Nestin was sufficient to activate cdk5 anctivity, miR-125b promote neural differentiation and migration might via activate cdk5 activity during early neuronal differentiation of NS/PCs. A recent report by Donghyun Park et al. has shown that the neural stem cells which derived from Nestin knockout mice showed dramatically reduced self-renewal ability but no overt defects in cell proliferation or differentiation . We speculated the discrepancy between our study and their study lies in the NS/PCs isolated from the embryo at different development stages and different tissues. In spite of the results of their study were inconsistent with our results, it can be interpreted as the Nestin have multiple functions at different developmental stages or in different tissues. In conclusion, these results support the conclusion that miR-125b is implicated in regulating its downstream target genes, Nestin, which play a crucial role in NS/PCs proliferation, differentiation and migration. In addition, our study does not exclude the possibility that additional target genes may also play a role in miR-125b function in NS/PCs. Cultured NS/PCs hold considerable promise both in terms of their application to a wide variety of research paradigms and in the development of potential therapeutic modalities . Several important breakthroughs during recent years have raised a hope that stem cell-based therapies could be used to restore function and integrity after acute brain injury and other disorders of the central nervous system. A better understanding of the role exerted by miR-125b in NS/PCs will contribute to offer promising prospects for their increasing application in the development of new cellular therapies in humans. Our data showed the involvement of miR-125b in the coordinated regulation of proliferation, differentiation and migration in NS/PCs. The work also indicated that miR-125b mediated silencing of Nestin may be involved in regulating NS/PCs cell proliferation, differentiation and migration. Primary neural progenitors were prepared by a modified version of a published protocol . All animal procedures were performed in accordance with Chinese Ministry of Public Health (CMPH) Guide and US National Institute of Health (NIH) Guide for the care and use of laboratory animals and was approved by the IACUC Bioethics Committee (IACUC, Institutional Animal Care and Use Committee-Bioethics Committee) of the Institute of genetics and developmental biology, Chinese academy of sciences. Briefly, neural tissue samples were dissected from the hippocampus of newborn Sprague–Dawley (SD) rat pups, cells were mechanically isolated by repeated trituration in a serum-free culture media composed of Dulbecco's modified Eagle's medium (DMEM) and F12 nutrient (1:1) (Invitrogen, Carlsbad, CA . USA). The dissociated cells were collected by centrifugation at 150 × g for 5 min and were resuspended in DMEM/F12 medium containing bFGF (10 ng/ml), EGF (20 ng/ml), and B27 supplement (Gibco, Invitrogen, Carlsbad, CA. USA). After culturing for 8 days, neurospheres formed and the cells were used for following experiments. The neurospheres were then digested with 0.25% trypsin into single cell suspension and seeded in poly-D-lysine coated 48-well culture plates at a density of 2 × 104 cells per well. NS/PCs was resuspended in adhesion medium containing DMEM, 10% FBS (Gibco, Invitrogen, Carlsbad, CA. USA). For differentiation experiments, the medium was changed to the differentiation medium serum-free DMEM (high glucose) with B27 supplement. The full length 3'-UTR of the human Nestin gene and the fragment containing the putative miR-125b binding site were amplified from human cDNA and individually cloned into a modified pGL3-promoter vector (Promega, Madison, WI, USA). The pGL3 luciferase reporter vector was modified by adding the restriction sites SpeI, NaeI, SphI, ApaI and PstI downstream of the coding region of the firefly luciferase, using PCR amplification with the following primers: forward/NcoI 5'-CTGCCATGGAAGACGCCAAAAACATA-3' and reverse/XbaI 5'-TGCTCTAGACTGCAGGGGCCCGCATGCGCCGGCACTAGTTTACACGGCGATCTTTCCGC-3'. The full-length 3’-UTR and the mutated 3’-UTR of Nestin was amplified by PCR using the primers listed in Table 1. Also, the 3’-UTR of ACTB was amplified by PCR using the primers listed in Table 1. The mutated 3’-UTR of Nestin was generated using site-directed mutagenesis according to the manufacturer's protocol. The primers containing the mutation are listed in Table 1. The site-directed mutagenesis kit (TransGen Biotech, Beijing, China) was used to generate the mutation in the 3' UTR of the Nestin gene by PCR, using the full-length 3' UTR of Nestin as the template. All PCR products were digested at the SpeI and SphI sites before cloning into the pGL3-promoter vector. To assess whether miR-125b could bind to Nestin mRNA 3' UTR, Hela cells were seeded in 24-well plates in DMEM high-glucose medium. The cells were transfected with 500 ng of wild-type or mutant reporter plasmid, 25 ng of Renilla luciferase expression vector, and miR-125b mimic (10nM) or miR-125b inhibitor (10nM) or equal amounts of NC, INNC (GenePharma Co., Ltd., Shanghai, China) using Lipofectamine 2000™ reagent (Invitrogen, Carlsbad, CA, USA), according to the manufacturer’s instructions. After 48 h, the cell extract was obtained, and firefly and Renilla luciferase activities were measured with the dual-luciferase reporter system (Promega, Madison, WI, USA) according to the manufacturer's instructions. The results were expressed as relative luciferase activity (Firely LUC/Renilla LUC). SiRNA oligonucleotide duplexes were synthesized by Genepharma Biotech (GenePharma Co., Ltd., Shanghai, China). The Lipofectamine siRNA complexes were removed after 6 h and fresh differentiation medium containing antibiotics was added to the cells. In rescue experiment, NS/PCs were cotransfected with the plasmid NES-640-GFP and miR-125b mimics. NS/PCs were transfected with Lipofectamine® LTX with Plus™ Reagent (life technologies, New York, NY) according to the manufacturer’s protocol. For each well of a Lipofectamine LTX transfection, 2.5 μg of NES-640-GFP plamid DNA and 10nM of miR-125b mimic were combined with 1.25 μl of Plus reagent (Invitrogen,catalog number 11514-015) in 500 μl of serum-free media for 5 min. 5 μl of Lipofectamine LTX (Invitrogen, catalog number 15338-100) was then added, mixed, and incubated for an additional 25 min before being added dropwise to cells. In another group, NS/PCs were cotransfected with Nestin siRNA and miR-125b inhibitor, 10 μM Nestin siRNA and 10 nM of miR-125b mimics were mixed together to perform the cotransfection experiments. Lipofectamine 2000™ reagent (Invitrogen, Carlsbad, CA, USA) was used according to the manufacturer’s instructions as mentioned above. Total RNA was extracted with TRIzol Reagent (Invitrogen, Carlsbad, CA, USA). Reverse transcription was performed using SuperScript™ III First-Strand Synthesis System (Invitrogen, Carlsbad, CA, USA). The primer sequences used in the experiment were listed in Table 2. Real-time PCR was performed using SYBR® Green PCR Master Mix (Roche, Mannheim, Germany) on CFX96™ Real-Time PCR Detection System (Biorad). Samples were run in triplicates. PCR conditions were 94°C for 3 min followed by 40 cycles of 94°C for 30 s, 60°C for 30 s and 72°C for 30 s, using a melting curve program and continuous fluorescence measurement. The results are reported as the relative expression after normalization of the transcript to glyceraldehyde-3-phosphate dehydrogenase (GAPDH; endogenous control) using the 2T–ΔΔC method . MiRNAs were extracted using the miRVana extraction kit (Ambion, Austin,TX, USA) according to the manufacturer’s instructions after a phenol-chloroform purification step. For quantification of miR-125b, 2 μg total RNA was reverse-transcribed and amplified by using the microRNA reverse transcription and detection Kit (Applied Biosystems, Inc. Foster City, CA) according to the manufacturer’s specified guidelines. All results were normalized to U6 levels that were detected by using the ABI miRNA U6 assay kit (Applied Biosystems, Inc. Foster City, CA). PCRs were normalized with the same test samples and U6 rRNA-specific primers. Significant differences in expression were determined using the Student’s t-test and considered significant if P < 0.05. The detection of cell proliferation has employed the incorporation of the thymidine analog BrdU (Bromodeoxyuridine, 5-bromo-2'-deoxyuridine) during DNA synthesis, followed by detection with an anti-Brdu antibody . In our study, experimental groups of cells were left in the cell media pulse-labeled with 10 μM BrdU (B5002, Sigma-Aldrich, St. Louis, MO) for 16 hours and stained with an anti-BrdU antibody (B2531, Sigma-Aldrich, St. Louis, MO) . For the BrdU staining, the cells were fixed with 4% paraformaldehyde in phosphate buffer at room temperature for 30 min and then washed and stored in PBS. All experiments were performed on a minimum of three litters in triplicate. NS/PCs were lysed with RIPA buffer (Sigma-Aldrich, St. Louis, MO) supplemented with proteinase inhibitor cocktail (Sigma-Aldrich, St. Louis, MO) for 30 min on ice to prepare the whole-cell lysates. The cell lysates were then clarified by centrifugation at 12,000 × g for 30 min. The protein concentration was measured by Bradford assay. Equivalent quantity protein lysates were electrophoresed in 10% SDS-ployacrylamide gel, and transferred to a polyvinylidene difluoride membrane (Amershame, GE, Buckinghamshire, UK). The membrane was block in tris-buffered saline (TBS) containing 10% nonfat milk and 0.05% tween-20 for 2 h at the room temperature. Primary antibodies were incubated overnight at 4°C, and primary antibodies included anti-Nestin (SC-21248, Santa Cruz Biotechnology Inc., Santa Cruz, CA), and anti-alpha-tubulin (Sigma-Aldrich, St. Louis, MO). The HRP labeled secondary antibody (PIERCE, Rockford, USA) was used for 2 h at the room temperature at the dilution of 1:5000. Four days after transfection, NS/PCs cells were fixed in cold 4% PFA for 30 min, followed by three washes with phosphate-buffered saline (PBS). After a 1-h blocking with 0.2% Triton X-100 and 3% goat serum in PBS, the cells were incubated with primary antibodies at 37°C for 2 hours. The primary antibodies used in this study include Nestin (1:400; MAB353, Millipore) , Brdu (1:500; B2531, Sigma ), Tuj1 (1:500,05-549, Upstate), Sox2 (1:100; 481400, Life technologies ), Map-2 (1:400; M1406, Sigma), Vimentin (1:100; V6630, Sigma) overnight at 4°C . All primary antibodies are diluted in the blocking buffer (1% goat serum in PBS) after which cells are washed three times with PBS, and incubated for 1 h at room temperature with secondary antibodies. The secondary antibodies are anti-mouse IgG FITC antibody (1:200, St. Louis, MO, USA) and anti-rabbit IgG FITC antibody (1:1000, St. Louis, MO, USA) diluted in blocking buffer. Nuclei are counter-stained with Hochest 33342 (1:500; 94403, St. Louis, MO, USA). The stained cells are washed three times with PBS and visualized on Zeiss 200 inverted fluorescent microscope (Carl Zeiss, Jena, Germany). The number of immunostained cells was counted in each of three random fields per well and the fluorescence images were selected randomly. Quantification of the immunofluorescence signal was performed by measuring average intensity in individual cells according to the Image J software manual. Migration assays were carried out in a 24-well transwell using polycarbonate membranes with 8-μm pores (Corning Costar, Cambridge, MA). For adherent NS/PC cells porous membrane was coated by collagen. NS/PCs cells at a density of 1 × 106 cells/ml in 100 μl of medium (DMEM/F12) were placed in the upper chamber of the transwell assembly. The lower chamber contained 600 μl of medium (DMEM/F12 + 1% fetal bovine serum + 100 ng/ml SCF) . After incubation at 37°C and 5% CO2 for 12 hours, the upper surface of the membrane was scraped gently to remove non-migrating cells and washed with phosphate-buffered saline. The membrane was then fixed in 4% paraformaldehyde for 15 minutes and then stained with hematoxylin and eosin. The number of migrating cells was determined by counting five random fields per well under the microscope at × 40 magnification. Assays were performed in duplicates and data was expressed as percent migration with control. All values are expressed as mean ± s.d. Statistical significance (defined as P < 0.05) was evaluated with SPSS software (SPSS GmbH, Munich, Germany) using the Student's t-test and ANOVA . We thank John E. Erikssona for providing Nes-640-GFP plasmid. This work was supported by grants from Chinese Academy of Sciences (KSCX2- EW-Q-24), National Natural Science Foundation of China (30930032), and the Ministry of Science and Technology of China (2011CB965001). YC performed the experiments and analyzed the data. ZFX performed the statistical analysis. YNZ and JH participated in cell culture. JS, WYD and XRL helped to perform RT-PCR and the Western blot analysis. BC helped to draft the manuscript. JWD conceived of the study and participated in its design. The authors have declared that no competing interests exist. All authors read and approved the final manuscript.